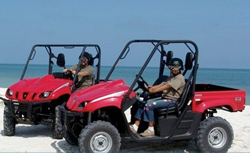 One of the most popular ways to explore Costa Maya is by Jeep, which offers a mix of fresh air and adventure. Drive deep into jungle trails, isolated terrain and secluded beaches. The jeep tour was fun. A fun drive in an old Jeep to a small little beach and authentic Mexican lunch. Definitely did not delivery on what was described. Quite bumpy but loved every minute. Quite bumpy but loved every minute. Couldn&apos;t stop laughing. Tequila taste testing incredible. the jeep tour was advertised as öff road"jeep tour, but never went off road. This was a spectacular tour and a great operator. Fun experience, however, the first Jeep broke down and the replacement wasn’t much better. Quite the adventure with great guides. We traveled with 11 Jeeps toured the area then stopped for a little while at the beach and had a light lunch which was include. The tour guides were the nicest young men, learned a lot about the town from them. The guides for this excursion were fantastic. This was highlight of our trip with Carnival. This stop was our favorite!! Costa Maya: we went on the ship&apos;s "Down and Dirty Mini Jeep Adventure".